Highly esteemed author Topics covered are relevant and timely Malliavin calculus provides an infinite-dimensional differential calculus in the context of continuous paths stochastic processes. The calculus includes formulae of integration by parts and Sobolev spaces of differentiable functions defined on a probability space. 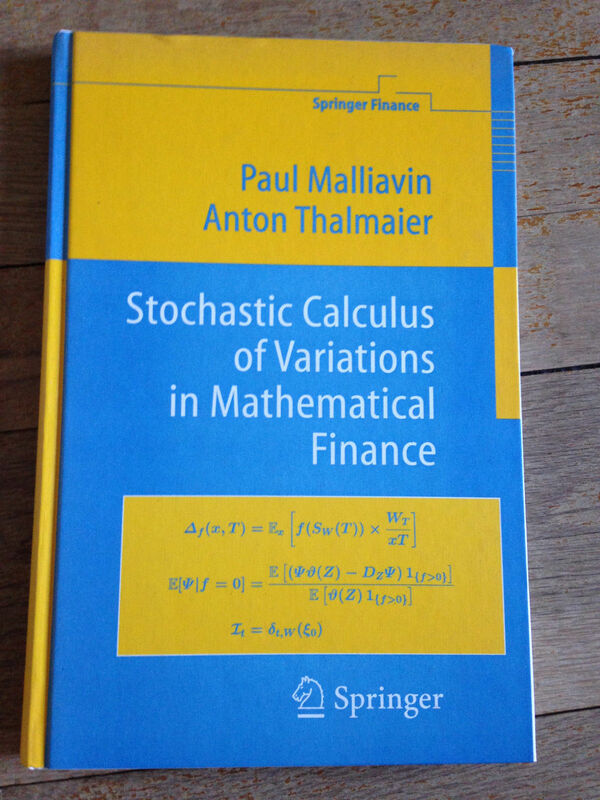 This new book, demonstrating the relevance of Malliavin calculus for Mathematical Finance, starts with an exposition from scratch of this theory. Greeks (price sensitivities) are reinterpreted in terms of Malliavin calculus. Integration by parts formulae provide stable Monte Carlo schemes for numerical valuation of digital options. Finite-dimensional projections of infinite-dimensional Sobolev spaces lead to Monte Carlo computations of conditional expectations useful for computing American options. The discretization error of the Euler scheme for a stochastic differential equation is expressed as a generalized Watanabe distribution on the Wiener space. Insider information is expressed as an infinite-dimensional drift. The last chapter gives an introduction to the same objects in the context of jump processes where incomplete markets appear. TOC:Gaussian stochastic calculus of variations.- Pathwise propagation of Greeks in complete elliptic markets.- Market equilibrium and price-volatility feedback rate.- Multivariate conditioning and regularity of laws.- Non-elliptic markets and instability in HJM models.- Insider trading.- Rates of weak convergence and distribution theory on Gaussian spaces.-Fourier series method for the measurement of historical volatilities. Gaussian Stochastic Calculus of Variations.- Pathwise propagation of Greeks in complete elliptic markets.- Market equilibrium and price-volatility feedback rate.-Multivariate conditioning and regularity of laws.- Non-elliptic markets and instability in HJM models.- Insider trading.- Rates of weak convergence and distribution theory on Gaussian spaces.-Fourier series method for the measurement of historical volatilities.